Bonding is a procedure that involves the application of tooth composite resin onto the surface of the tooth. We typically use this technique as a fast solution for a more attractive smile. Tooth fractures, persistent stains, spaces between teeth, and rotated teeth can be eliminated in one easy procedure. Bonding is not as durable as porcelain veneers or crowns but can last for a number of years with proper home care. Tooth colored fillings fall into two categories and are used to replace traditional silver fillings. With a direct method the metal fillings can be safely removed and a composite resin applied to the tooth. Indirect restoration (onlays or inlays) are made of porcelain and are created in a dental laboratory. It takes two appointments to restore teeth with these aesthetic, white porcelain fillings. Bonding the front teeth requires just one appointment and no anesthesia is usually needed. A small amount of tooth structure is removed to improve adhesion of the composite to the tooth. An adhesive agent is applied to the prepared tooth followed by a tooth colored composite resin that matches your enamel. Dr. Bartosh will shape the soft resin to acheive the best aesthetic contour and then expose the bonding material to a natural blue light curing laser to harden the resin. Once polished to a glossy smooth surface your new smile will last for many years with proper daily home care. For indirect tooth colored inlays and onlays, the old filling is removed and an impression of your tooth is made. A replica model is made from the impression so that our dental laboratory can create a porcelain filling to precisely fit your tooth. During the time of fabrication you will be wearing a white temporary filling that is removed at the second appointment. The porcelain filling or onlay is set in the tooth and secured with dental adhesive. Another day comes and as you are brushing your teeth, shaving or putting on lipstick and you notice all of the discolored, old fillings in your front teeth. As you look closer you see chips in the enamel, stains that won't go away or the uneven alignment of your teeth. Do you remember when you were younger and had a pleasing, brighter smile? Dr. Bartosh has for years transformed flawed teeth into picture perfect smiles with custom made Porcelain Veneers. Created in a dental laboratory, they are made of fine layers of dental porcelain that overlay teeth to mask imperfections. The slight rotation of your teeth as well as stains, chips, cracks and fractures are all gone, leaving only a beautiful smile you are ready to show to the world. 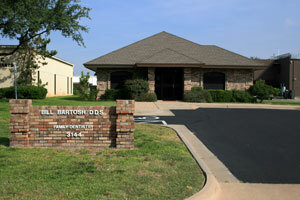 Please schedule your examination and consultation with Dr. Bartosh so that any questions you may have can be answered. With just two appointments you can have the smile you have been dreaming about. If you look at your smile and are unhappy with the stains, yellowing and discoloration, Dr. Bartosh has just the answer for you. In the course of a few short weeks you can have the smile you have been desiring. We offer the WHITE AND BRITE system designed to be used during your daily spare time to whiten your teeth. Teeth "Bleaching" has been used by dentists for many decades and has proved to be safe and unharmful to natural teeth. The active chemical in the gel is carbamide peroxide which is similar to hydrogen peroxide. Impressions will be made of your teeth so that custom flexible trays can be constructed. The whitening gel comes in syringes and is dispensed into the custom tray. Once placed in the mouth, the trays remain on your teeth for thirty to forty-five minutes. If you experience some sensitivity it is recommended that you whiten your teeth every other day and also rinse with ACT flouride, an over the counter mouth rinse. Because each person has tooth structure of different density, some people may need to whiten their teeth for an extended period of time to achieve the desired results. Also, yellow teeth whiten quite well while tetracycline stained "grey" teeth are more difficult to brighten. As a final note, Crest offers their crest strips as an inexpensive means to a brighter smile. If, however, you are just not satisfied with the results you are getting, we are happy to offer our prescription strength product, White and Brite. We are all living longer these days through the miracles of modern medicine. The years, however, may have brought the need to have teeth extracted due to accidents or disease. We may also find the teeth that were filled years ago are now sensitive or even painful to eat with. Sme may be chipped, cracked or discolored from old fillings and unsightly to look at. Our long term solution is to restore these teeth to strength, comfort and beauty by means of crowns and bridges. What is a crown? Every tooth has an outer enamel cover that overlays the live part of the tooth called the dentin. The enamel, which is two to three millimeters thick and very durable,is designed to last a lifetime. When the need arises to restore a tooth the crown basically replaces the enamel. Under local anesthesia, the tooth is prepare by Dr. Bartosh. This is a painless process that is carefully and artistically accomplished. Once prepared, an impression is made from which a stone model replica is created. The laboratory uses this model to fabricate your crown. While the crown is being made, you will be wearing a temporary crown to maintain your bite. When the crown returns from the laboratory, your temporary crown will be removed and the crown will be tried in for fit and correct function. With your approval the crown is cemented permanently in place. What is a bridge? A bridge is composed of a replacement tooth (or teeth) called a pontic connected to the teeth on opposite sides of the space by means of crowns. The pontic is physically connected to the crowns so that the bridge is one piece made of two crowns on either end with the pontic in the middle. For natural, life like crowns and bridges, porcelain fused to noble metal is used to achieve very high esthetics and strength. With proper daily care and some dietary restrictions these restorations will provide many years of comfort and beauty. Call today for an exam and consultation. Dr. Bartosh will be pleased to answer any questions you might have. Many people have friends and family members who have some or all of their teeth replaced by removable dental prosthesis. Today patients can expect to have natural looking smiles and stable, comfortable teeth to enjoy life with. This is truly something to consider. For various reasons people lose some or all of their teeth. Replacement of lost teeth is essential to overall physical well being and one's self esteem. The quality and consistency of your diet can be determined by your ability to chew your food. A person's overall health can be directly related to the quality and consistency of their diet. Before the actual construction process begins Dr. Bartosh works with his patients to determine what aspects are most important to them. Our laboratory uses the highest quality materials and life-like acrylic teeth to construct comfortable and natural looking dentures. For patients who require their remaining teeth to be extracted before full dentures are delivered, Dr. Bartosh will be glad to make a consultation appointment with a referring oral surgeon. For patients fortunate enough to have some healthy, stable teeth remaining in the dental arch, a removable metal-frame partial denture can provide many years of dependable service. Partial dentures have clasps that secure the metal framework to the teeth opposite the space where teeth are missing. Partials that fit properly are comfortable and secure to wear. For our patients who find that no denture adhesive is strong enough to hold their denture securely, Dr. Bartosh recommends that dental implants be considered. After their placement in the jaw bone by an oral surgeon and allowed to integrate with the bone, Dr. Bartosh will place attachements into the base of your denture. There are several substantial benefits that go along with implant therapy. For upper and lower dentures, the support provided by implants helps you to feel like you are eating on nartural teeth. They also substantially lessens the deterioration of the jaw bone that would otherwise take place over the years. All patients who have implants under their dentures absolutely love the firm retention they experience. It is the closest thing to natural teeth we can provide. For further answers to your questions, please schedule an appointment with Dr. Bartosh. What you have heard from family and friends about this treatment being painful is just no longer true. With the advancement of dental anesthetics the procedure is so painless that some patients fall asleep during the procedure, believe it or not! For most patients an antibiotic is prescribed in advance of root canal therapy to reduce the inflammation and infection outside the tooth so that the local anesthetic works well. Patients sometimes ask why a root canal is necessary. Inside of each tooth is a hollow chamber where the pulp exists and canals where blood vessels bring nutrients into the tooth for vitality. Through traumatic injury, fracture or a deep cavity, the pulp can be susceptible to oral bacteria that kills the pulp. The build up of toxins within the tooth cause severe lingering pain when eating or drinking something hot (coffee) or cold (ice tea). The longer the internal toxins exist the greater the chance that external bone deterioration and abcess formation will take place. This usually leads to the loss of the tooth. Patients who see Dr. Bartosh in the early stages of this disease can expect the tooth, in most cases, to be saved with a root canal therapy. What actually is a Root Canal Therapy? Simply put, the infected canals are cleaned out, widened through progressively larger file sizes, disinfected and sealed with a biologically inert substance. Some patients may experience post-operative discomfort for several days but this can be controlled with over- the- counter medication. A last thought. When back teeth (bicuspids and molars) have had root canal therapy completed, they still function well but are NONVITAL. This means they are susceptible to fracture under the everyday normal chewing pressure that teeth put against each other. To prevent the loss of a tooth from a serious fracture, it is necessary to have crowns made that will provide strength into the years ahead.